Amplify helps groups work together toward effective political action. Group leaders set the most important actions of the day, while members use the Amplify app to easily accomplish them and encourage others to do the same. Does your group already use Amplify? 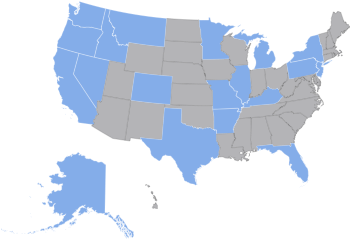 Amplify helps groups like take effective political action together. Your members can call members of congress and take other action right from their phones — and then cheer each other on! Leaders choose priorities for their groups, either by creating their own “actions” or importing them from similar regional or national groups. Group members see the most important actions at any given moment, with clear explanations for why the actions are important and what members can do to accomplish them. Amplify makes it simple to take action. 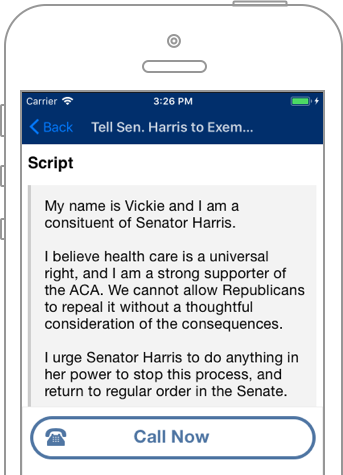 Members can call elected officials, for example, by referring to a script and starting the call from within the app. 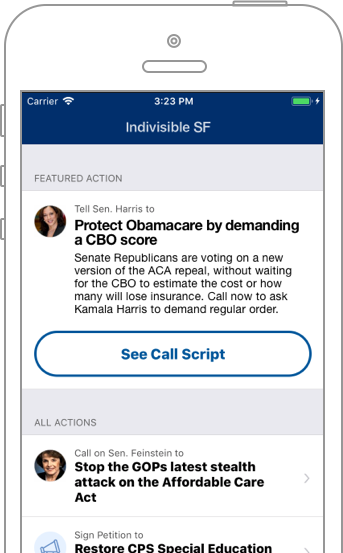 Groups are already using Amplify to call politicians, sign petitions, organize rallies and meetups, and more. Support for more actions is coming soon. Everyone can see who has taken action and cheer them for their work. Members can track personal and group achievements. Collective action is proven to motivate more consistent and effective participation in the future. Plus, taking action is more fun when it’s done together. Send realtime notifications to your group when immediate action is required. Rally members to respond when you need them most. Powerful tools help leaders shape their groups. Coordinate with other groups to share or import actions. 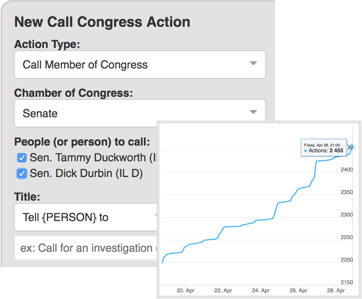 Track actions to see what’s getting done. Recognize and empower your most active members. 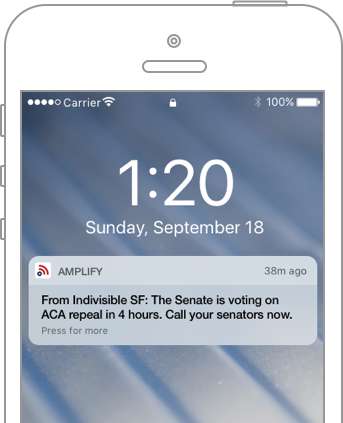 Amplify is a free, non-profit app that empowers the resistance by helping teams take action together. 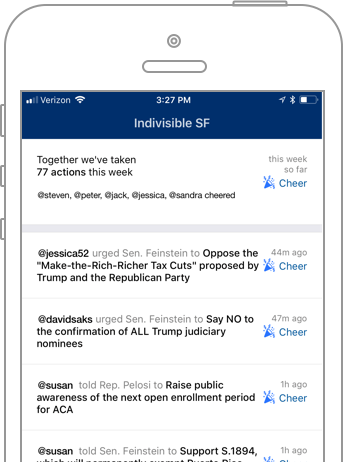 Created by and for Indivisible San Francisco, Amplify was quickly picked up by other groups and is now in active use in 18 states and growing. We’re partners with the Indivisible Guide, and funded by New Media Ventures and others. Full-time volunteers: Ted & David. Product Designer: Joel Lewenstein. So many people have jumped in and helped in big ways: Aram, Ben Paul, Julianne, Bruckner, Ali, Adora, Robby, stuffonfire, Steve J, Anna, gbren, Saha, Cara, Tim, Ti, Jess, Julianne, Jared, Michael V, Chris Downie, We Persist, Thelma, ladydangerdame, wordstern, Jacques, and all the early adopters at Indivisible SF, and more. And Leah, Ezra, and others for starting Indivisible. Want to get involved? We need software engineers!